Welcome to the 14th installment of Past Greatness, a monthly series I'll be doing showcasing great, older works. All albums listed below are of 8+ quality. For the first month of January, we look back into recent history for a genre-shaking conundrum as Young Fathers' is on the brink of said album's follow-up; Cocoa Sugar. To many, art is nothing more than a commodity that's meant for short-term enjoyment. From music to movies, television shows to video games, insert fashionable work of the time will soon be forgotten when another trend weaves its way in. That's because art's progressive, constantly fluctuating based on the undulating interests of various cultures. For many albums, classification comes with ease. These works don't challenge the status quo. There's others though that demand your attention, going so far as to name themselves White Men Are Black Men Too. Art is meant to be provocative, dynamic, and liberating. It's meant to expound the inner-workings of a brain, or brains, while simultaneously opening up yours to new ideas, beliefs, or morals. 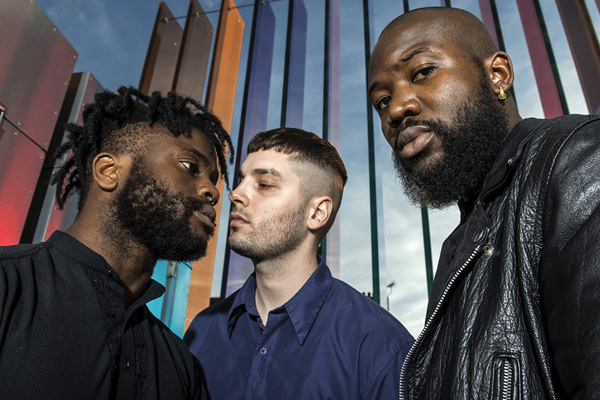 As far as modern musicians go, there's few that accomplish this feat better than Young Fathers, the boundless trio hailing from the United Kingdom. They don't just challenge the standards of music, breaking borders between Hip-Hop, Lo-Fi, Experimental, R&B, Indie, Electronic, Noise, Gospel, and Pop. They liberate through movements and emotions deemed taboo by the always-stagnate mainstream society. I mean really, White Men Are Black Men Too? Whatever it means, someone's going to have an opinion on it. And that's art. To make a complex formula simple, what makes the trio's second LP a work of this thing we call art lies in the grand divide between Pop and Experimental. Accessible and labyrinthine. In my time dissecting music, there's few types more exciting than those capable of fusing the two paradoxes together. White Men does that in spades, always offsetting something irresistible with a toxic bite. Think of the poisonous apple given to Snow White by the Witch. 'Shame' parlays a bevy of minimal percussion insistent on addictive rhythms with vocals purposely left hollow and scratchy, synths darting both cheap and erratic. It is also the album's best, and a textbook example of the merits of Lo-Fi music. There's also the soundtrack diddy of 'Liberated' marred by uncool choir chants, the groovy Hip-Hop rumble of 'Rain Or Shine's' finale that's abruptly slashed by silence, and the gorgeous R&B harmonies of 'Sirens' neutralized by discordant strings. The album is filled, top to bottom, with this insurmountable duality. As enticing as it is repulsive. As beautiful as it is grotesque. Yet, for listeners keen on appreciating each half, White Men tantalizes with a strong brush throughout. There is no bad song in the dozen, something that's not a surprise given Young Fathers' standards, but impresses nonetheless when compared to various contemporaries. Musically isn't the only way Young Fathers tip-toes the divide. They do so lyrically as well, challenging listeners with abstract sentiments that rarely have direct meaning, yet approaching almost every song with emotions that are universally understandable. Each member does a phenomenal job depicting their various feelings, allowing for listeners who may not master their coded linguistics to relate through the power of unspoken human contact. Of course the production helps as well. Moments into '27,' with the twinkling glockenspiel and opening line "I know that it's hard for me," you're already expecting an uplifting song that teeters on Gospel without the cliche elements. 'Rain Or Shine' and the splendid 'Nest' tackle opposing ends of the love spectrum, the former distant in lyrics and tone, the latter more engaging and lively. And the opening/closing combo of 'Still Running' and 'Get Started,' off name alone, send indications of escapism to a new plateau. The former begins with a incredible line of significance ("tonight I don't love God"), only for 'Get Started' to summarize the record with purifying Gospel. Young Fathers' lyrics are ambiguous enough, their emotion direct enough, to allow for anyone in the midst of a struggle to endure and overcome. And why not do it through some of the most lovable Experimental Pop tunes of the 2010's? As cryptic as art can be, if the title of White Men Are Black Men Too tells us anything, the ultimate form of expression can be breathtaking as well. And that's exactly what this album is.